A friend of mine just brought it to my attention that I more often than not call my sister “Sister” rather than using her name. Perhaps it is because I cherish our sisterhood and the return to being close again. My mother was not a mother; nor my father a father. 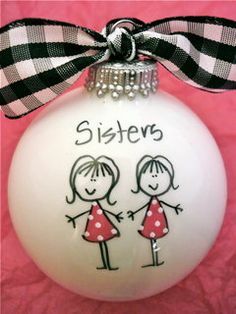 But my sister was very much a sister — a confidant, a companion, a friend. We were estranged for a number of years. We were mad at each other for good reasons. But the anger finally dissipated, leaving in it’s wake only the feelings of loss. We were ready to reconcile. Love won out. How often does that happen? Not often enough. Now, I can have all the memories of she and I together without the sadness. Oh, things aren’t perfect. She rarely lets me get a word in edgewise during our phone conversations. But, now I am just glad to hear her voice after missing it during our years of estrangement. And so, I write her letters about me and my life so I can feel heard and known. I am sure she is accepting some foible of mine too. There has been much loss in my life in recent years: my husband’s passing , the loss of our home and some of my sanity. But, this Christmas, I can celebrate getting back something that was lost to me — my sister. Maybe, there is a god, and maybe this was a miracle. I don’t know. But it is definitely a blessing. And I am grateful.